Eliminate the need for software. Flip the image on your screen with this handy converter. Hi! I’m Sam Tucker, and I know that because I’m reading it off a teleprompter. Hey, I love these things. They make me seem so much more intelligent and comitant. Er…charismatic. Charismatic! But while they work great with special teleprompter software, I wish I could just load up my Word document or PowerPoint presentation without it being mirrored. Well, it turns out the answer isn’t far away at all. It’s been here, the whole time…in my pocket! Introducing the HDMI MirrorBox. With this nifty little gadget, you just plug one end into your computer and the other into your display and it will mirror any program that you load up, making everything from Word, PowerPoint, even websites easy to read on a teleprompter. So check your pockets, but if you don’t have one, you can find out more on Teleprompter Mirror. A great value at only $349.95! One of the most common questions we’re asked is how to flip PowerPoint slides. In this video, Krista demonstrates how the HDMI MirrorBox makes this easy. 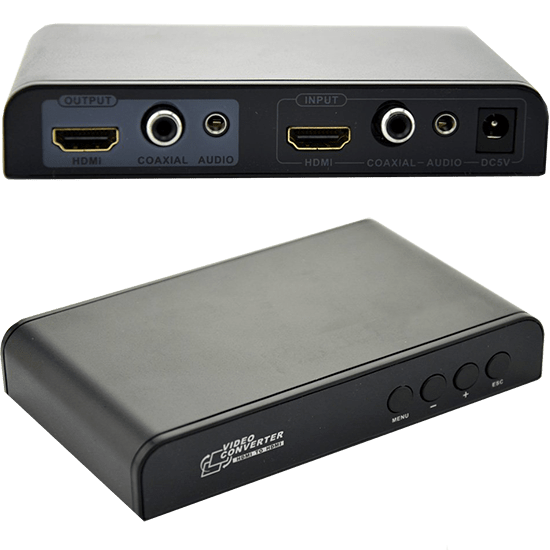 HDMI MirrorBox is standing by to be ordered by you! If you delay, who knows…the MirrorBox might still be in stock. Maybe.